--- SOLD --- Antiaircraft sight for the german machinegun MG '34. Marked with waffenamt . Perfect. Anti-aircraft sight for MG '42. --- SOLD --- Antiaircraft sight for the german machinegun MG '42. Marked with waffenamt . Perfect. Armoured vehicles and panzer headset and troat mike. Binoculars 6x30 tan finisch colour. Calculating instrument for German pilots. --- SOLD --- Instrument for the calculation used by German pilots. Marked and dated, still working. Perfect condition. 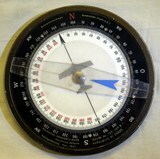 Compass with original instructions and case. Field flashlight dynamo working Phlips for the Wehrmacht. Germa compass with leather safety straps.